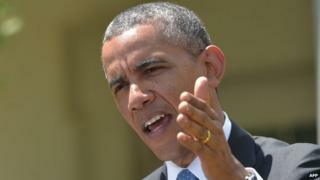 Image caption US President Barack Obama called the botched execution of inmate Clayton Lockett "deeply troubling"
US President Barack Obama plans to ask Attorney General Eric Holder to investigate problems surrounding the application of the death penalty. The US leader's announcement comes just days after a botched execution in Oklahoma drew widespread attention. Mr Obama called inmate Clayton Lockett's prolonged death earlier this week from an improperly delivered lethal injection "deeply troubling". The president said he has conflicting feelings regarding the death penalty. "This situation in Oklahoma I think just highlights some of the significant problems," Mr Obama told reporters. Americans should "ask ourselves some difficult and profound questions around these issues", he added. Mr Obama, trained as a lawyer, said the death penalty is warranted in some cases - including child and mass murder - but its application in the US is problematic. At issue are evidence of racial bias and potential exoneration of some inmates, he said. The US leader said he will task Mr Holder with providing "an analysis of what steps have been taken, not just in this particular instance, but more broadly in this area". Meanwhile, Oklahoma Governor Mary Fallin has ordered an "independent review" of the state's execution protocols, saying the state's department of public safety would lead the inquiry. Prison officials in Oklahoma inserted lethal drugs into Lockett's groin after failing to find a vein elsewhere. They took 51 minutes to find a suitable vein and did not realise the one they chose in his groin had collapsed. The inmate succumbed to a heart attack 10 minutes after his execution was stopped, as he writhed and mumbled. Lockett had been sentenced to death for shooting 19-year-old Stephanie Neiman and watching as two accomplices buried her alive in 1999. Ms Neiman and a friend had interrupted the men as they robbed a home. The problems surrounding Lockett's execution come amid a wider debate over the legality of the three-drug method and whether its use violates guarantees in the US constitution "against cruel and unusual punishment". US states have encountered increasing problems in obtaining the drugs for lethal injections, amid an embargo by European pharmaceutical firms.